This article is for my readers who love Tarot and Oracle Cards! I’ve been doing Tarot card readings in Brisbane for several years now. Funnily enough, I avoided cards early in my psychic career, because I associated them with sorcery. I preferred palmistry and numerology, as they suited my science background. After all, your hands and date of birth have been with you for a lifetime. 2017 Update – My husband Kris Anderson is an expert Tarot Reader in Brisbane, also I’m now a fan of the Chakra Insight Oracle (Australian). I’m moving away from constantly using Hay House products – see this post. It was only when my Mind Body Spirit Festival clients kept asking for card readings that I began to experiment with different decks. I discovered that Tarot forecasts are wonderful, because they suit visual people, who need to see things to believe in them. It’s amazing how many times I have said something (e.g. you’re about to get a job), before pulling a card with ‘new job’ on it, for example. The Universe always delivers consistent messages, assuming you are working with a reputable reader (see my thoughts on psychic readers and spiritual maturity). What’s the difference between a Tarot Card and an Oracle Deck? A Tarot Deck has 78 cards with 4 Suits (like playing cards) – it is a more formal way of doing readings, and there is a history behind each of the cards. An Oracle Deck can have any number of cards and is designed for a specific type of reading (e.g. Romance, Past Lives, Life Purpose – see below). I use at least one Tarot Deck and one Oracle Deck when doing psychic readings, for variety. Don’t believe the myth that you have to be given a Tarot deck. I have bought 90% of mine and they work perfectly! Cards give your Heart a chance to speak to your Head. They are not meant to be chosen logically! Look for a deck that makes you feel something, then check the price and reviews. If you can, shuffle through a deck before buying it (this is possible if you buy decks at expos or shops with displays etc.) Pick a card at random and see if it resonates with you. If you have a psychic reading and love someone’s Tarot or Oracle cards, take a photo of the set so you can find it later. It’s good to try new decks. I go shopping a few times a year as my needs and my client’s needs often change. I pray over my cards after purchasing them. I also touch each card and bless it, before using the deck for readings. Between readings, I shuffle my cards, and tap them with one hand, with the intention that all excess energies are removed. I also say ‘clear’ in my head or out loud. You can sage or smudge your deck, or hold it to your heart and imagine white light cleansing it. Some psychic readers don’t let people touch their cards, but I don’t mind. That said, I keep a couple of decks at home for private use. Start off by doing readings for yourself – get to know your cards before you start helping others. I often allocate cards as Yes or No – for example, I consider an ‘Ace’ card a Yes but the Devil or Death card a No. You can ask ‘What do I need to know right now?’ out loud, before pulling a card. This will give you a general message. My favourite Tarot spread for beginners is a 3 card reading on any topic i.e. Past/ Present/ Future (from left to right). Don’t keep pulling cards if you don’t get the answer you want – the first answer is usually the truth! Keep a journal, where you record what cards appear, and how these are relevant. Writing down or photographing your readings helps you to build a relationship with your cards. Tarot readings reflect your energy at a moment in time, so they are not always 100% accurate – if you change your choices, you change your future. Hint: If I pull a lot of ‘dark’ cards, I will clear my energy (e.g. go for a walk, meditate, or receive a healing). This is usually enough to shift my mood and my next card reading will be more optimistic. 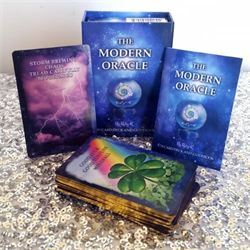 Note: I’ve mainly profiled Doreen Virtue’s card decks below – not only are these some of the easiest to find, Doreen is a Master 11 Lifepath in numerology like me, so I resonate with her books and products. Find your lifepath. Pros: My favourite deck, I’ve used it thousands of times and had excellent feedback. People love the images and explanations on each card. This is the deck I use regularly. Cons: Large cards, which can be hard to shuffle. It’s important not to always read the cards literally, otherwise the session can be formulaic. Pros: So user-friendly! Small, high quality cards which are easy to shuffle, Australian-designed and my clients love the simple, powerful messages. This is the deck I would give a beginner. Cons: None. This deck will leave you wanting more – I would love to see another series one day. Pros: One of the most gloriously illustrated decks I’ve seen. It’s full of starry, profoundly uplifting images. Easy to use and messages are given on each card. This was my #1 favourite deck until the Archangel Power Cards came out. Cons: Large cards, which can be harder to shuffle. Use your intuition when interpreting the cards rather than always taking them at face value. Pros: This was my first Tarot Deck – I find the images extremely inspiring and a form of colour therapy. Many clients had emotional responses to this deck (in a good way). The cards are small, easy to understand (one word on each card) and unique. Cons: Does not follow traditional Tarot meanings, so could be confusing if you are looking for a Tarot deck e.g. for a course. Pros: I adore this Oracle deck, and keep by my bedside. Alexis is a Master 29/11 Lifepath too. She helped me a lot when I first began psychic readings. Deck includes a 320-page guide, which explains animal totems, elementals, and much more. Cons: More upmarket but absolutely worth the price. Pros: Wow! I find this deck so powerful I can only draw one or two cards every now and then, because they bring me so much insight. I could be biased as Kuan Yin is one of my patron Goddesses (I am Chinese), but they are extremely healing. Cons: Large cards, and not a predictive deck – more of a soul wisdom journey. Pros: Children, teenagers and the young at heart will resonate with these cards. The deck has a good variety of messages, and no negative or scary cards. A wonderful gift for beginners. Cons: Geared towards fairy lovers and may not be suitable for all types of clients – messages are helpful but not detailed. Pros: Dr Weiss’s influence shows in the direct messages and good image choices – no messing around with these cards, they go straight to the heart of your issues. Cons: I occasionally use these cards for psychic readings to pick up a theme, but they are more suitable for past life insights. Read more on my past life regressions. Pros: I had been looking for a career readings deck and was super happy to find this one – it’s been so helpful for guiding clients (and myself) through work transitions. Nice, clear messages and pictures. Cons: Limited types of careers covered (biased towards the healing, creative and teaching professions, as you might expect). Pros: Perfect if you’re looking for insights into your love life or if you have clients who want to know about potential or current partnerships. Cons: Some cards could seem negative, although I like their ‘wake-up’ call approach. Use discretion with this deck – if you don’t like the answer, wait before trying again. Otherwise you are manipulating Spirit. Pros: One of the most delicate and elegant decks I have seen. Great for people looking for a Tarot deck with style – think Tim Burton meets fairy princess. Cons: I find the guidebook a little conservative and tend to interpret the cards my way. -My friend said he kept attracting the Death card in Tarot, which creeped him out. I said that’s a good sign as it means you’re starting a new chapter. We did a 13 card spread and would you believe it, the last card we turned over was the Death card (in the centre of the cross). I fell off my chair! -A client pulled a card which told them they needed to change their attitude. They got annoyed and asked if they could try again. Despite shuffling the deck, they pulled the same card out two more times! That’s what I call Angel humour. -I always ask my clients to choose a deck and to shuffle the cards before I lay them out. Cards often fly out of the deck while this is happening – I put these aside as they are ‘urgent’ messages from the client’s Spirit Guides (not a sign the client is unco-ordinated). -Once, a client asked me about her children. I said ‘who shall we start with?’ The wind blew over a card called ‘The Sun’ – so we started with her son’s wellbeing. Thanks for your support. I hope you enjoyed this crash course in Tarot and Oracle card reading. If you like this blog, please join my facebook page The Numbers Queen. You’re welcome to post on the timeline. You can also subscribe to my e-news for articles (see homepage). Or write to me below, or via email. Comments will be published once approved. SMS 0408 898 028All articles on this blog are copyrighted. Content may not be reproduced without written permission from the author. Comments made below will be reviewed before they appear online.